Aim and Objectives: This study tries to estimate the relationship between corneal topographic patterns and topographic parameters with the clinical findings among keratoconus cases. Design: This was a descriptive cross-sectional study. Materials and Methods: Keratoconic patients between the age group of 10–30 years were included in this study. Biomicroscopic examination, retinoscopy, and corneal topography were done for the patients, and their correlation with topographic pattern was studied. Results: The study group included 89 keratoconic eyes having defective vision. The mean age of patients with keratoconus was 20.13 years (standard deviation ± 4.56). This study showed a statistically significant positive correlation between a few topographic pattern and inferior–superior values. Conclusion: Varied topographic patterns are seen among keratoconus cases diagnosed based on an elevated KISA index. Atypical patterns may be indicative of other causes of corneal ectasia. A comprehensive evaluation of clinical findings, topographic patterns, and keratometric values is essential in the diagnosis and follow-up of keratoconic eyes. Keratoconus is a bilateral corneal ectasia characterized by myopic astigmatism. Videokeratography is the most sensitive screening test to diagnose keratoconus. Anterior corneal surface and the precorneal tear film act as the most important component of the refractive surface of the eye. Corneal topography provides a quantitative data about the corneal surface. Color-coded contour maps of the cornea are very useful in diagnosing corneal ectatic conditions. Hot colors like red represent steep cornea and cool colors like blue represent flat portion of the cornea. The improvement in the computer-assisted videokeratography increases our knowledge about the corneal surface. This study estimates the relationship between corneal topographic patterns and topographic parameters with the clinical findings among participants with keratoconus. Participants diagnosed as keratoconus were selected for the study. Any case with a KISA index value >100% on corneal topography was diagnosed as cases of keratoconus. The study period was 12 months. The participants belonged to the age group of 10–30 years. The study was approved by the Institutional Ethics Committee. Cases with a history of ocular surgery and trauma and outside specific age group were excluded from the study. Demographic profile and symptoms were noted. Distant visual acuity was assessed with Snellen's visual acuity chart at a distance of six meters. Anterior segment examination and corneal topography were done. Wet retinoscopy and autorefractometry were done after putting Homatropine Bromide 2% eye drops or tropicamide-phenylephrine drops depending on their age (one drop every 10 min apart thrice). Postmydriatic test was done on the 4th day. Shin-Nippon corneal topographer CT-1000 was used for corneal topography. The patient's chin was kept in the chin rest and forehead against the strap. He was instructed to fix at the target. Using joystick, the examiner adjusted the image so that the pupil was centered in the centering box. Then, the instrument automatically caught the corneal topographic map. Simulated K (SimK1), SimK2, central K, KISA, skewing of radial axis (SRAX), the I–S values, and the patterns in color-coded maps were recorded from the instrument. Statistical analysis was done with SPSS-18.0 version (PASW Statistics for Windows, SPSS Inc., Chicago, USA). Qualitative analysis was done with one-way ANOVA test. The study group included 89 eyes of patients with keratoconus between 10 and 30 years in age. The mean age of patients with keratoconus was 20.13 years (standard deviation [SD] ±4.56). The mean spherical equivalent was 5.25 D (SD ± 4.56). Spherical equivalent was calculated by adding half of cylinder to the sphere obtained based on retinoscopy values. Mean Simk1 was 52.77 D with (SD ± 5.69). SimK1 represents the maximum keratometry value in diopters obtained on topography. The mean Simk2 was 47.43 D (SD ± 3.88). SimK2 refers to the K-value orthogonal to SimK1 in diopters. The mean inferior–superior (I–S) asymmetry was 6.63 D with SD ± 4.25, which varies between −5.84 D and + 22.23D. The I–S asymmetry values were calculated from the power difference between five inferior points and five superior points 3 mm from center at 30° intervals. The mean central K was 52.37 D (SD ± 5.8), which varies between 38.95 D and 72.13 D. Central K is the keratometry value of center of the cornea in diopters. About 98% (n = 87) had SRAX between 21° and 90°, varies between 11° and 90°. SRAX in degrees is the difference between the horizontal meridian denoted by 180° and angle between steep axis above and below the horizontal meridian. The mean KISA was 6459.56%, varies between 103% and 92221%. 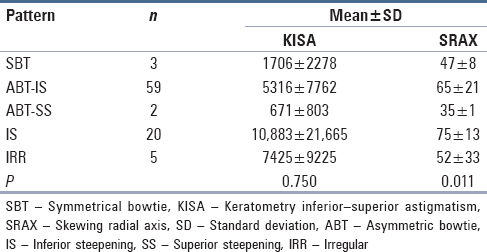 KISA index (%) is calculated as per the formula K × (I–S) × (AST) × (SRAX) × 100 ÷ 300 in percentage unit, where K is the central keratometry value in diopter. The distribution of patterns based on color-coded maps observed on topography is given in [Figure 1]. 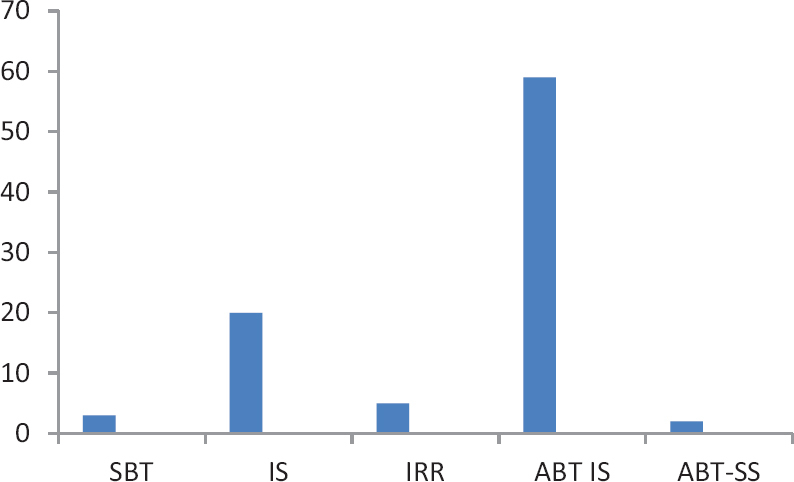 Nearly 59% had asymmetric bowtie (ABT) with IS (ABT with inferior steepening). This was followed by 20% with I–S (inferior steepening). ABT was prevalent among either gender. ABT with inferior steepening occurred among 68% (n = 43) cases with best-corrected visual acuity (BCVA) better than 6/12. There was no statistically significant correlation between age and gender with the corneal topographic pattern. The topographic parameters were compared with the topographic patterns observed. This is represented in [Table 1] and [Table 2]. There was no significant correlation between topographic pattern and topographic parameters (SimK1, SimK2, central K, and KISA). However, SRAX had a statistically significant correlation with topographic patterns. Maximal skewing was seen among cases with inferior steepening and ABT with inferior steepening. One of the criteria for the diagnosis of keratoconus based on topographic parameters is predominance of inferior steepening over superior steepening. The topographic parameters were compared with the I–S asymmetry observed. This is represented in [Figure 2]. The correlation between I–S values with SimK1 (P = 0.001) and central K (P = 0.03) was statistically significant but not with SimK2 (P = 0.086). The variation in the I–S values among the different topographic patterns is given in [Table 3]. The mean I–S value was maxed with inferior steepening (9.04 D) and least with superior steepening (0.02 D), and this finding was statistically significant. About 89% (n = 79) cases had anterior segment findings. The common anterior segment findings were positive Munson's sign (61%), positive Rizutti's sign (55%), abnormal pattern in Placido's disk (54%), prominent corneal nerves (53%), Fleischer ring (48%), and Vogt's striae (35%). Oil drop sign on retinoscopy was observed among (20%) cases. The I–S values were compared among those with and without anterior segment findings [Table 4]. Those with anterior segment finding had a higher I–S value than those without anterior segment findings. This finding was not statistically significant. Those with distortion of placido's disk image had a higher I–S asymmetry value. This observation though clinically relevant showed borderline statistical significance (P = 0.061). 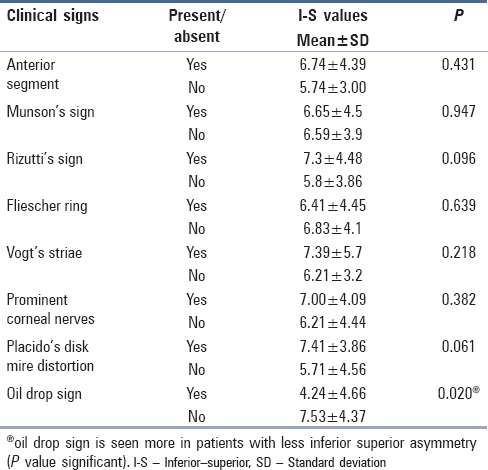 Those with oil drop sign on retinoscopy has a lower I–S asymmetry value (P = 0.02). There was no statistically significant correlation between age and gender with corneal topographic pattern. According to Kim and Chang, there was no statistically significant difference among topographic patterns with age or gender of patients. Topuz et al. reported that age- and gender-related changes in corneal astigmatism lead to change in corneal topography as age progresses in both sexes. The majority of cases with a BCVA of better than 6/12 had ABT with inferior steepening. This is in concordance with the observations of Kanpolat et al. They reported that the topographic configuration alone may not be a good predictor of visual function. The patterns observed on topography indicate the changes in keratometric indices among keratoconus. Maximum mean SimK1 (55.99 D) was seen in the irregular topographic pattern. Holladay and Liu et al. studied an association between mean keratometry power and topography pattern in keratoconus., In this study, the majority of cases has inferior steepening with or without ABT. Liu et al. also reported that areas of the greatest curvature were located in the inferior temporal quadrant, followed by inferior nasal, superior temporal, and superior nasal quadrant. There was a statistically significant relation between patterns and spherical equivalent but not with keratometric values. This is in contrary to the observations of Bogan et al. According to Bogan et al., there was a statistically significant difference among patterns for keratometric astigmatism but not for spherical equivalent refraction, mean keratometric power, or age of the patient. There was no significant correlation between topographic pattern and topographic parameters (SimK1, SimK2, central K, and KISA). SRAX was more among those with inferior steepening. Those with higher I–S asymmetry also had higher SimK1 and central K values. This supports the fact that the ectasia in keratoconus is closely related to the spherical power of the eye. The observation of a higher mean I–S value among those with inferior steepening and least mean I–S value with superior steepening corroborates this. Anterior segment findings were not observed among all participants. Those with anterior segment finding such as positive Munson's sign, positive Rizutti's sign, abnormal pattern in Placido's disk, prominent corneal nerves, Fleischer ring, and Vogt's striae had a higher I–S value than those without anterior segment findings. However, these observations were not statistically significant. A lower I–S asymmetry value was noted among those with oil droplet reflex on ophthalmoscopy. It can be assumed that oil droplet reflex on ophthalmoscopy occurs when ectasia involves superior and inferior cornea is affected resulting in lower I–S asymmetry values. The existence of other causes of keractectasia has to be ruled out among cases with keratoconus presenting with atypical topographic patterns like superior steepening. Koc et al. reported that crab claw pattern typical of pellucid marginal degeneration was seen in inferior keratoconus also. They suggest that tomographic and densitometric evaluations are required to differentiate between these two conditions. Cases with atypical topographic patterns have to be considered for such further evaluations. Atypical topographic patterns are seen among keratoconus cases diagnosed based on an elevated KISA index. The patterns correlated with the spherical equivalent and skewing of the axis but not with other keratometric values or KISA index. Corneal ectasia was more among those with higher refractive power. Clinical signs did not show any association with the topographic patterns or keratometric value. Oil droplet reflex indicated a lesser I–S asymmetry. Atypical patterns should alert ophthalmologists toward the existence of other causes of corneal ectasia. A judicious interpretation of clinical findings, topographic patterns, and keratometric values is essential in the diagnosis and follow-up of keratoconic eyes. Hashemi H, Beiranvand A, Khabazkhoob M, Fotouhi A. Corneal topography patterns in the Tehran eye study: Warning about the high prevalence of patterns with a skewed radial axis. Middle East Afr J Ophthalmol 2014;21:72-6. Goto T, Klyce SD, Zheng X, Maeda N, Kuroda T, Ide C, et al. Gender- and age-related differences in corneal topography. Cornea 2001;20:270-6. Li X, Rabinowitz YS, Rasheed K, Yang H. Longitudinal study of the normal eyes in unilateral keratoconus patients. Ophthalmology 2004;111:440-6. Levy D, Hutchings H, Rouland JF, Guell J, Burillon C, Arné JL, et al. Videokeratographic anomalies in familial keratoconus. Ophthalmology 2004;111:867-74. Kim HC, Chang SD. Relationship between topographic patterns and corneal astigmatism in Korean adults. Korean J Ophthalmol 2003;17:91-6. Kanpolat A, Simşek T, Alp NM. The evaluation of normal corneal topography in emmetropic eyes with computer-assisted videokeratography. CLAO J 1997;23:168-71. Bogan SJ, Waring GO 3rd, Ibrahim O, Drews C, Curtis L. Classification of normal corneal topography based on computer-assisted videokeratography. Arch Ophthalmol 1990;108:945-9. Topuz H, Ozdemir M, Cinal A, Gumusalan Y. Age-related differences in normal corneal topography. Ophthalmic Surg Lasers Imaging 2004;35:298-303. Holladay JT. Keratoconus detection using corneal topography. J Refract Surg 2009;25:S958-62. Liu Z, Zhang M, Chen J, Luo L, Chen L, Gong X, et al. Corneal topography and thickness in keratoconus. Zhonghua Yan Ke Za Zhi 2002;38:740-3. Koc M, Tekin K, Inanc M, Kosekahya P, Yilmazbas P. Crab claw pattern on corneal topography: Pellucid marginal degeneration or inferior keratoconus? Eye (Lond) 2018;32:11-8.